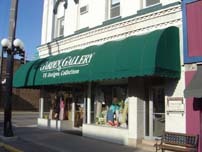 VS Designs Garden Gallery has always been known for specialty clothing such as jackets, sweaters, silk and linen, as well as hand painted apparel, scarves, furniture and gifts. Vibrant colors to subtle beauty in fun to elegant summer looks … moving in to beautiful fall sweaters and jackets, hand painted glass ornaments and pillows. Their lower level has a warm cottage/cabin appeal.